Carbon Monoxide is highly dangerous and can occur in any setting where oil, gas, coal or turf are being burned. You can’t see it or smell it. In fact it is often called “the silent killer”. You can protect your home from the dangers of this deadly gas by taking preventive measures and by learning to recognise the symptoms of carbon monoxide poisoning. We recommend that all customers learn about carbon monoxide. There is a very informative document called The Facts About Carbon Monoxide, which details what you need to know. You can open the guide by clicking on the button to the right. Carbonmonoxide.ie is a website specifically designed to inform people about the dangers of Carbon Monoxide. The website explains what Carbon Monoxide, the risks to people in the home and what safety precautions you can take. There is more information on the facts of Carbon Monoxide on the website Carbonmonoxide.ie. Alternatively you can call 1850 79 79 79 for further information. The dangers associated with carbon monoxide are promoted to the general public every year through Carbon Monoxide Awareness Week. The annual event is held in September or October each year and in 2017 it ran from September 25th to October 1st. 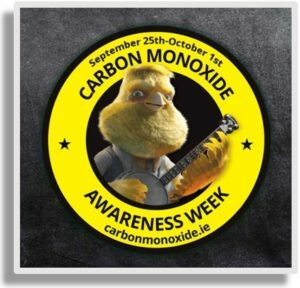 There is much more information about the promotion campaign along with lots of useful information on the Carbon Monoxide Awareness Week page of the website.